Hello everyone! 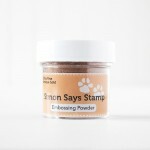 Today is the reveal of Simon Says Stamp’s November 2018 card kit, Thanks and Leaves! 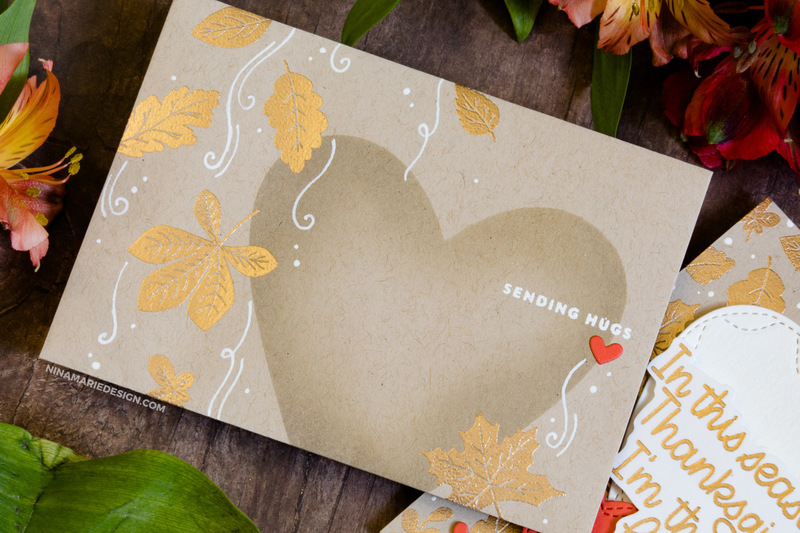 I really enjoyed creating with this Fall-inspired kit, which includes stamps, tags, envelopes and even the Tim Holtz Snarky Stickers and Butterfly adornments. Not only have I put together a tutorial showcasing how I made a coordinating card and envelope set, but I also have a video walking you through all the contents of the kit. You can watch both videos below. The solid stamps in the Thanks and Leaves set made for a beautiful, Antique Gold embossed background; I also embossed the greeting with the same color of powder. I love how this color looks against the Neenah Desert Storm cardstock. Memory Box has a Wrapped Stitch Heart die set, which I used to cut out some hearts to add onto the card. I also used one of the 4-bar, kraft envelopes included in the kit to create a coordinating envelope. The envelope is what inspired me to make the card at the size that it is; 3 1/4″ x 4 3/4″. Be sure to watch the video to see the simple steps I took to make this pretty envelope! I hope that this project inspires you to create with this beautiful, November Card Kit from Simon Says Stamp called, Thanks and Leaves! Hey Nina, LOVE LOVE LOVE this card and envelope set. I have a question. How does the embossing hold up in the mail? Thanks so much for sharing! Nina Marie, what a wonderful card & envelope. Anyone would be so blessed to receive it! Gorgeous matching set, fabulous use of those pieces out of such a pretty & versatile kit. The envelope alone would make my day as it’s so pretty & well done. Thank you so much for sharing your magical work & you are right about the butterflies far to gorgeous to send hehehe. Love your card & envelope! Really enjoyed your video. I’m looking forward to receiving my kit. A great kit and your card & envelope is beautiful. The gold embossing always looks so beautiful on kraft. Beautiful card Nina, and I love the matching envelope!